BMW will be on board the 35th America’s Cup as Global Partner of the America’s Cup Event Authority (ACEA), the event organizer. This move takes the premium automobile manufacturer’s involvement as a partner of global competitive sailing to a new level. BMW will also support ORACLE TEAM USA as Technology Partner. The team’s mission is to win the America’s Cup for the third consecutive time. Russell Coutts, CEO of ACEA, said “Cutting-edge technology and precision engineering are central to both the America’s Cup and BMW. Both organizations are innovation driven and we are changing the game in our respective fields. 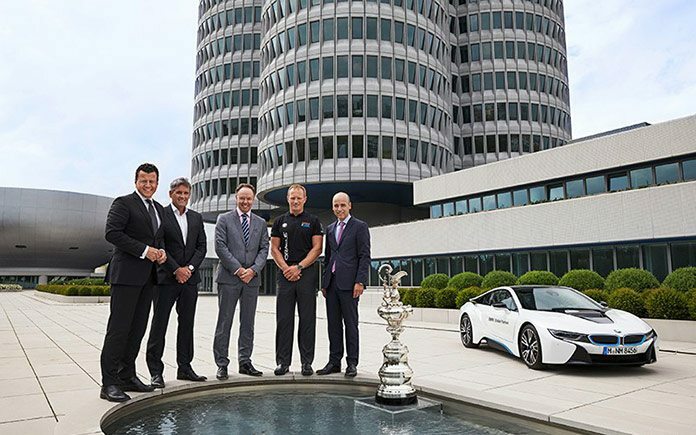 BMW is also one of the most iconic global brands, with tremendous vision and a groundbreaking attitude which can only enhance the America’s Cup. As Technology Partner, BMW will provide its engineering competence to ORACLE TEAM USA in fields including aerodynamics. 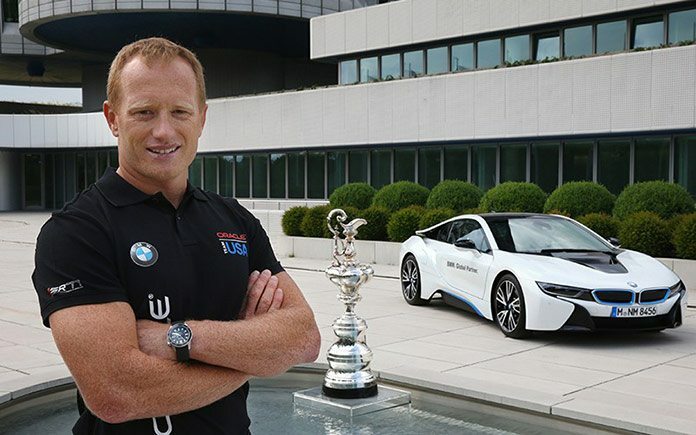 “BMW was an important technology partner for us when we won the America’s Cup in Valencia in 2010,” said Jimmy Spithill, the winning skipper of the last two editions of the competition. BMW and ORACLE TEAM USA will come together as engineering and R&D leaders, sharing knowledge and technological innovations in various fields. BMW will be fully integrated into the global marketing, branding, communications and race event for the 35th America’s Cup, from now on until the Finals in 2017. The iconic BMW logo will be visible on turning marks on the race course, on the boat, the wingsail, and the team gear of ORACLE TEAM USA, as well as on the stern plate of competitor yachts. Within the TV broadcast, BMW will provide the boats’ and athletes’ performance data through inserts which will create images that take the fans figuratively right into the action on board. In the Louis Vuitton America’s Cup World Series race villages in 2015 and 2016, as well as in Bermuda in 2017, BMW will provide fleets of cars to transport hospitality guests, VIP’s and team members. These include a wide variety of current BMW’s product range such as the BMW 7 series, the revolutionary plug-in hybrid sports car BMW i8 and the all-electric BMW i3. 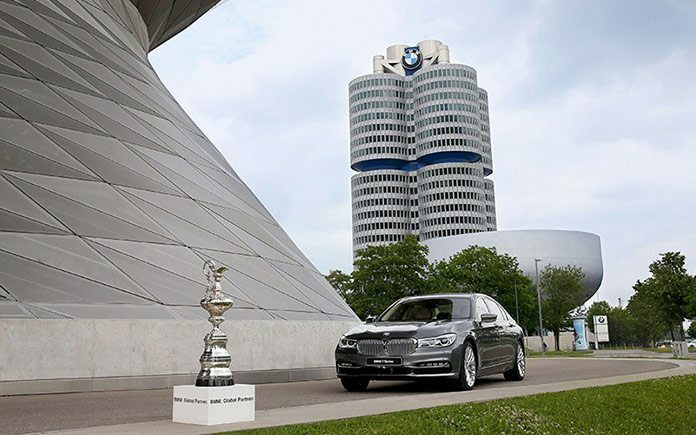 For BMW, this commitment to the America’s Cup is the manufacturer’s fourth involvement in the prestigious competition. BMW was the first premium automobile manufacturer to participate in the event with the ORACLE BMW Racing team at the 31st America’s Cup 2002/03 in Auckland (New Zealand). A further two campaigns followed with the BMW ORACLE Racing Team, which defeated the defending champions from Switzerland, Alinghi, to win the 33rd America’s Cup in Valencia in 2010.